Mork has returned to Ork – and our lives are a lot more empty for it. I do not usually write on celebrities, but in Robin Williams the world has lost a comic genius, a brilliant actor and director, someone who made the world challenge misconceptions, and an all too flawed human being. I have long been an admirer of the work of Robin Williams, be it in his comedic roles, his stand up, or his serious movies in which he proved himself to be a much more than a one trick pony. Robin’s acting can have you laughing one minute, and reduced to tears the next. Good Morning Vietnam, The Fisher King, Awakenings, The Dead Poet’s Society and Bicentennial Man, among many others, shall go down in cinematic history as true classics. Pink News has paid tribute to Robin Williams with his portrayal of gay and gender-defying roles. 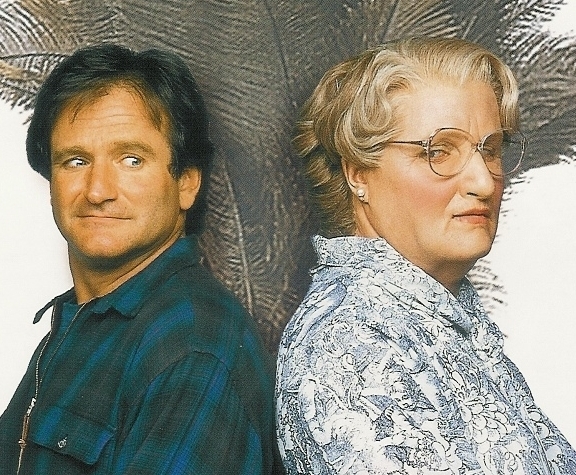 The first of these was of course Mrs Doubtfire, released in 1993, in which Williams played the character Danial, whose marriage had broken down and who disguised himself as a Scots nanny, Euphemia Doubtfire, in order to get clandestine contact with his children. The movie was hilarious, and his make-up won an Oscar for his transition. There was one thing about the movie made me cringe, however, and that was the continual assertion from Mrs Doubtfire that she came from “England”. No disparagement to the English, but no Scot worth their salt would ever say they come from England. It would be like a US citizen saying they come from Canada or Mexico. The real Mrs Doubtfire was an old lady in the Stockbridge area of Edinburgh, Scotland, who would sit outside with her knitting on sunny days, and who loved children so much that if she saw parents scolding or slapping their children, she would give them a piece of her mind. Had she been alive to see the movie, there can be no doubt she would have given Robin Williams the sharp end of her tongue. Around the time Mrs Doubtfire was released, Robin Williams was maintaining that he was born and brought up in Edinburgh. The comments in the movie made me doubt that, and sure enough it was years later that he admitted to lying about that, due to alcohol abuse and depression. This was to be the first insight into his tortured soul. Smith has since been forced to apologise for making that statement. I’m not one for forced apologies myself; if an apology is enforced, it is meaningless. But he is not the only person who has branded Robin Williams as a coward. I have seen some other people say such things online. If anyone thinks that suicide is a cowardly act, then I would ask them to consider the case of my paternal grandfather, whom I never knew. In the days before the UK had a National Health Service, my grandfather was dying slowly and in agony with throat cancer. When he could take it no more, he swallowed a bottle of Lysol to burn his insides out and bring him the death which he so much longed for. One wonders how many cowards would be capable of doing that? And nobody who has never suffered depression can understand just what drives depressives to the brink of suicide. These are people who have suffered for years with mental anguish, until they can take no more. When you have had inner turmoil, day after day, year after year, and tried to keep that from others, or others either don’t understand, couldn’t care less, or more likely, both, then it is an affront to that person to even suggest they are a coward. In fact, because it is based upon ignorance, it is just plain stupid to make any such comment. Allied to the suicide is cowardly claim is the statement that suicide is selfish. Selfish for whom exactly? Again, if someone is suffering mental anguish and nobody seems to understand that, how dare they even suggest that the depressed person is being selfish. Why do people think the suicidal are selfish? Because they choose to do what they like with their lives? Except those pointing the finger expect those who are suicidal to stick around to fit their comfortable little worldview. Just who then is being the selfish one? Many comedians, both living and dead, have been long time sufferers of depression. The English comedian Tony Hancock took his own life after his brilliant Blood Donor sketch. His friend and co-actor Sid James told afterwards that after the sketch he found Hancock with his head in his hands, saying “How can I ever follow that?” It is that strive for perfection which drives many comedians. The marvellous Stephen Fry is bipolar, and quite prone to what many would call strops. Nobody knows the reasons behind the apparent suicide of Robin Williams, because no-one knows the extent of the mental anguish he was going through. Likewise, until anyone has been addicted to alcohol (or other substances), or has seen a loved one suffering such addiction, then they can have no idea just how destructive that can be. I speak as one whose eldest sister drank herself to death at the age of 49. There is one thing we can all be sure of however; not one of us is Robin Williams, not one of us ever walked a mile in his shoes, therefore there is not one person on the face of the planet has the right to judge him, or the action which he took. Nanu-Nanu Robin – nothing and no-one can hurt you any more. Well, I have to say you could have knocked me down with a feather. In a shock announcement, former boxing promoter Frank Maloney has revealed living as a woman for the past year, wants to be known as Kellie, and is to undergo gender reassignment surgery. And why is this such a shock, dears? Well this is the same Frank Maloney who in 2004 stood as United Kingdom Indpendence Party (UKIP) candidate for London Mayor and made so many openly homophobic comments that James Davenport of the Gay Conservatives called him a “dangerous extremists” and called upon UKIP to deselect him as candidate. Well, he certainly got that latter statement right. But then, few Londoners voted for Maloney and the neo-fascists of UKIP. In the light of this announcement, one can only assume that this deep-seated homophobia possibly came from Frankie Baby’s own denial and the self-loathing which that denial creates. Having been in denial for so long myself, I can certainly relate to the self-hate which the need to be female can imbue in one. As a boxing promoter, Frank Maloney was hugely successful, and once managed Lennox Lewis to the World Heavyweight Crown. His secret life of a transsexual, alongside the macho image of boxing, caused him severe depression, which led to him at one point attempting suicide with a mixture of booze and prescription drugs. A family man with two daughters, Frank’s marraige also broke down due to his sexuality, and she states that telling his wife and daughters was the hardest thing he ever did. Perhaps we should not be so surprised. 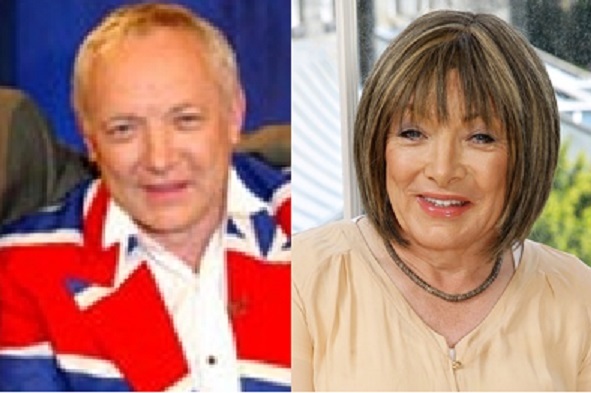 Frank Maloney was always a charismatic character, well-loved by some and well-known for his outrageously flambouyant dress sense, which included Union Flag suits. Oh, Kellie was just dying to be let out. She certainly states that she has always known she was born into the wrong body. Perhaps therefore we can see the choice of the macho sport of boxing as overcompensating. I for one am therefore willing to give Kellie a chance. It would be nice for her to apologise for Frank’s homophobic remarks, but I personally am not expecting one any time soon. Likewise I do not know if she is still a UKIP member, and if so I would like her to leave that odious party, but I won’t hold me breath on that one either. I shall however be watching and listening to Kellie very carefully, dears. Whilst it should not be so, we are all aware that there are bigotry problems even within the LGBT community, and while one would trust that Kellie would be more tolerant than Frank, that yet remains to be seen. I have to say that at 61 years of age, Kellie makes a striking figure of a woman. And her brave decision should send a clear message that it is never too late for trans people to fulfil their lives. It sadly also gives me no pleasure that Kellie has already been subjected to the same kind of comments online which Frank Maloney used to dish out to others.